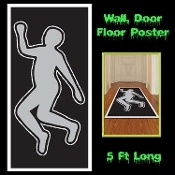 Realistic Life Size MORGUE DEAD BODY BAG Horror Halloween Prop Decoration Walking Dead Dexter CSI Coroner Autopsy Costume Accessory. 6-Ft black Poly nylon cloth sack with full zipper front for easy access. CITY MORGUE FORENSIC UNIT print. Hilarious Airblown Inflatable Costume Funny Western Rodeo Mascot Horseback Rider COWBOY RIDING BULL. Includes HAT and self-inflating fan with battery pack to fully inflate the unisex costume for hours. Requires 4-AA Batteries, NOT included. Fits most adults 5 to 6-feet tall. 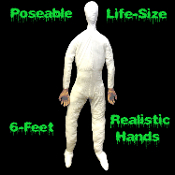 INFLATABLE MANNEQUIN PROP DUMMY Life-Size Halloween Shop Display-MALE - Need an extra dead body in your haunted house? 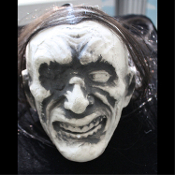 Inexpensive spooky Halloween props. Lightweight store or character display for every holiday season. Props can be deflated for easy storage fully dressed! 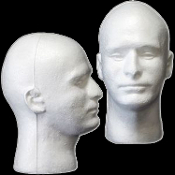 Life size Styrofoam-MANNEQUIN HEAD-Prop Building Supplies Costume Display-MALE White Sculpted Face Body Part - Halloween Haunt prop-making supply, point location, acupuncture head models, safety prop dummies and student coursework or target practice! Hilarious Airblown Inflatable Unisex Costume Funny Western Rodeo Mascot Horseback Rider COWBOY RIDING HORSE. 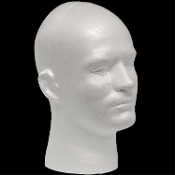 Includes HAT and self-inflating fan with battery pack required to fully inflate for hours. Uses 4-AA Batteries, NOT included. Fits most adults 5 to 6-feet tall. This is one Funny Big Wrestler! 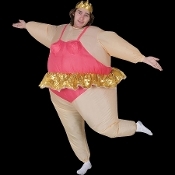 Hilarious Airblown Inflatable unisex jumpsuit costume with character style inflated wig. Includes self-inflating fan with battery pack, and a detailed instruction sheet for operation and care of the costume. Fits most adults 5 to 6-feet tall. Hilarious Airblown Inflatable Costume Funny Riding Gorilla. 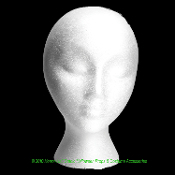 Includes self-inflating fan with battery pack required to fully inflate the unisex costume for hours, separate inflatable head cover hat. Uses 4-AA Batteries, NOT included. Fits most adults 5 to 6-feet tall. Hilarious Airblown Inflatable Costume Funny Sports Fan Team Mascot HOCKEY PLAYER. Includes self-inflating fan with battery pack required to fully inflate the unisex costume for hours. Uses 4-AA Batteries, NOT included. Fits most adults 5 to 6-feet tall. Hilarious Airblown Inflatable Blimpz Black Skeleton unisex jumpsuit costume self-inflates. 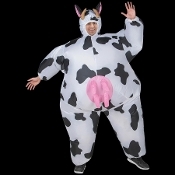 Includes self-inflating fan with battery pack required to fully inflate this funny costume for hours, and instruction sheet for operation and care. 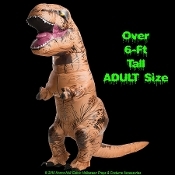 Fits most adults 5-to 6-feet tall. 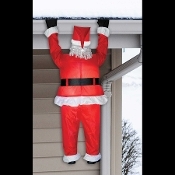 This funny life size realistic outdoor Airblown inflatable Roof Hanging Santa Claus causes laughter from neighbors and holiday guests. 6.5-feet tall. This Christmas Lawn Yard prop decoration lights up, self-inflates. Includes fan and hardware to attach to house roof gutters.